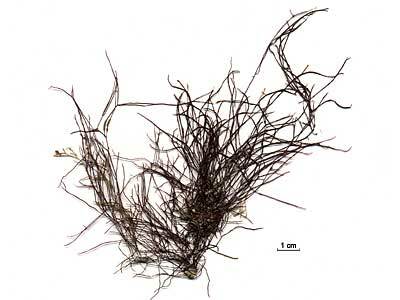 Description: Gametangial fronds stiff, erect and wiry, almost black in colour, growing to a maximum of 15 cm long. The tetrasporangial phase (Porphyrodiscus simulans) is crustose and grows to 30 cms in diameter. 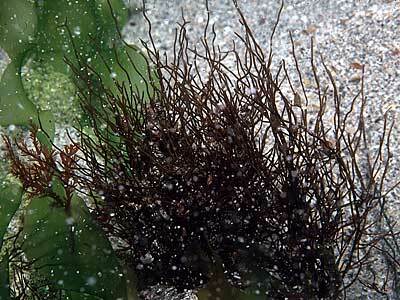 Habitat: Epilithic in rock pools of the lower littoral and in the sublittoral to a depth of 12 m.
Distribution: Generally common around the British Isles. Europe: Azores, Portugal, Atlantic coasts of Spain and France, Netherlands, Baltic Sea, Norway, Faroes, Spitzbergen and Iceland. Greenland. Atlantic coast of North America: Canada, Maine, New Hampshire, Massachusetts, Rhode Island, Connecticut and New Jersey. Further afield: Arctic Sea circumpolar to Baffin Bay, Pacific and Indian Oceans. Gametangial thallus unmistakable due to its wiry nature. The crustose phase however could be confused with other encrusting species. Morton, O. & Picton, B.E. (2016). Ahnfeltia plicata (Hudson) Fries. [In] Encyclopedia of Marine Life of Britain and Ireland.